General Description: It is an upright, spiny, biennial growing up to 8 feet tall. Flower Description: Flowers are solitary or in clusters of 2 to 3 flower heads with reddish purple flowers. Leaf Description: Dark green leaves are deeply lobed to compound with hair on the undersides and spines along the leaf margins. Stem Description: Stems are tough and have spiny wings. 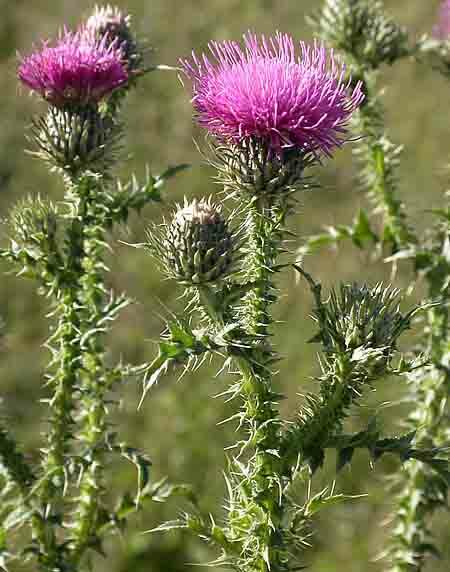 Plumeless thistle invades pastures, meadows, and fields crowding out desirable forage plants. Livestock will not graze in areas heavily infested with plumeless thistle.